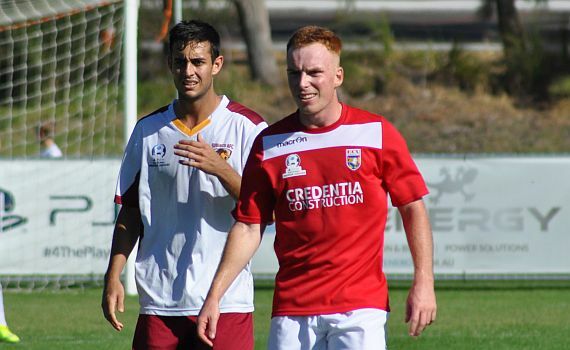 When midfielder Henry Durr returned to ECU Joondalup, many at the club said it was the best signing the club had made this season. That was a big statement with the likes of Gordon Smith, Kevin Moon and Lewis Italiano joining this season, but the 21-year-old has been an ever-present this season so far and has showed what a good player he is. The youngster had a season at Perth Glory, but injuries and being played out of position hindered his progress at the club, but the Glory’s loss is the Jacks gain. Durr was outstanding last week at Subiaco and won the Credentia Construction Man of the Match, and he said they are starting to gel nicely. “It was really good performance and we’ve been solid for the last month and it’s even more important not to concede any goal in that time, and we’re starting to score goals, so everything is taking shape,” he said. Durr said the pace of Gordy (Smith) and Daryl (Nicol) up top is fantastic, and he said it’s the midfielder’s role to use it. “We have worked really hard on our shape and going forward we have pace to burn and both Gordy and Daryl are starting to work well together,” he said. Jacks assistant Coach David Tough said Durr has been outstanding this season. “Henry is a great player and when we spoke to him at the start of the season about heading home, we told him straight – ‘We want you’, and it looked like he was being messed about by the Glory, and we were delighted when he agreed to come home,” Tough said. Durr said he joined the club to have success and he believes they are heading in the right direction and said the game at Perth on Saturday is a huge test. “We knew at the start of the season we had a good squad, but we have let ourselves down in some games but we are gelling nicely now and it’s four wins on the trot and four clean sheets, so we are now getting the results we deserve and hopefully push on to the finals,” he said.